The main advantages of investing in paper for electronics and energy storage devices are as follows: 1) the low cost of the technology; 2) the potentiality to recover device components and recycle the substrate as well as the active materials; and the production of 3) environmentally harmless and 4) biocompatible devices. Already, as we have reported in numerous previous Nanowerk Spotlights, electronic paper displays are a commercial reality and prototypes of things like paper batteries, solar cells, nanopaper transistors, thermoelectric nanogenerators, graphene-enabled optoelectronics, biosensors, and even microfluidic lab-on-chip devices are under development. In these applications, paper can be used simply as the flexible substrate onto which researchers transfer thin-films, nanoparticles or other nanostructures via various processes such as printing. Alternatively, by exploiting its porous fiber-like nature, paper can be used as an active film by infiltration or copreparation with electronic materials to give additional functionalities to the cellulosic paper. A recent review article in Advanced Functional Materials (« Printed Solar Cells and Energy Storage Devices on Paper Substrates ») presents a detailed analysis on the state of the art of the use of paper and cellulose-paper-like systems for the realization of photovoltaic devices, supercapacitors, and batteries, where at least one of the main constituent layers has been deposited or synthesized via printing or solution processing techniques. In particular, the authors cover research progresses on the engineering of paper as substrate for photovoltaic and storage devices. They discuss the printing techniques that have been utilized so far for the manufacturing of these devices and also cover durability and recyclability issues. 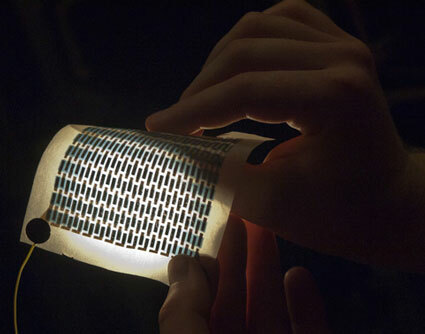 The substrate represents a key part in the fabrication of devices for energy harvesting and storage. Typically, the properties of the substrate have to be tailored considering different parameters such as the type of device, its durability, the architecture chosen, the deposition technique used, and the technological process implemented. Special surface treatments are necessary to enable optoelectronic thin-film device deposition on paper. Firstly, it is necessary to decrease its natural surface roughness and porosity to ensure the efficiency of the printing process, reducing the risk of ink diffusion among paper pores by capillary action and also to prevent cracks and defects in the conductive layers. Secondly, the application of coating layers prior to ink deposition on the surface encapsulate the cellulose surface and also improve its color and/or light reflectivity. The characteristic of paper that is considered as a drawback for its implementation in thin-film devices, i.e., the rough surface, may represent a desired property in energy storage devices. Paper fibers have up to several tens of micrometer length and 20 µm width, and form pores with micro dimensioned diameter. Conversely from what is observed in thin-film solar cells, this high porosity enables to exploit the capillary action to absorb active electrode materials. To achieve this, researchers have pursued different approaches mainly based on functionalization with various nanomaterials such as single-walled carbon nanotubes, silver nanowires, graphene, or nanoparticles. The characteristic of these coatings lies in their feature to completely cover the cellulose fibers and electrically connect neighbor fibers. The successful application of large-area printing techniques to light harvesting and storage devices will enable not only a seamless integration of these two types of symbiotic devices monolithically on the same substrate, but also the possibility of applying these with other types of printed optoelectronic devices – e.g., transistors, sensors, and displays – for the development of paper electronics of the future. The main substrates for printed electronics have historically consisted in glass, plastic sheets, and metal foils. The development of paper electronics has seen a surge in interest by research laboratories in more recent years, bringing together the three key fields of printing, paper, and electronics at the same time. Currently, spin coating (high control over film thickness but high material waste) still represents the main liquid solution deposition technique utilized in over 50% of the works the authors reviewed for photovoltaic devices on paper. Drop casting is also frequently used to deposit active inks on paper substrates, typically when thicker films are required or when wetting issues arise during spin coating. However, drop casting has the drawback of offering very poor control on film thickness. Both these techniques are not applicable to high-throughput roll-to-roll industrial-scale manufacturing. In the case of batteries and supercapacitors the main means of deposition that have been utilized have been screen printing and inkjet printing. In this section, the authors review the developments of printed solar cells on paper substrates. They analyze a critical issue first: producing effective electrodes, one of which needs to be transparent. Then they cover the literature on the different photovoltaic technologies fabricated on paper in which at least one of the layers has been solution processed. They conclude this section by describing issues for future development. This part of the review gives an overview of paper-based supercapacitors and batteries, focusing on the technological issues and the achieved results obtained with every technology. The authors note that only a very limited number of manuscripts report on shelf life of devices deposited on paper, and the impact of humidity and temperature, and the action of molds, bacteria, other organisms, and pollution on the degradation of paper. Analyzing the literature, the authors note that it becomes apparent that several aspects still need to be solved to achieve long lifetime and high-performing devices able to power future generations of flexible devices on paper. In particular, for the substrate even though several coatings have been studied to smoothen the paper surface and increase the durability, stability is still an open issue. These aspects are still under study and have not been directly correlated with the lifetime of solar cells and storage devices. Concluding their review, the authors see two main areas for potential applications, assuming that the various technical issues that exist today can be effectively addressed. First, paper-based devices can be inserted individually in common commercial products. It is likely that the most promising sector for initial markets will be that of paper batteries and supercapacitors. In fact, power capacitors based on paper are already in use in applications such as utility poles. The versatility in being able to adapt to different forms and shapes should open up their insertion in many future product markets. Second, the more exciting and futuristic potential is that of being integrated with other printed electronics (in order to power the electronic functionality) as well as graphics on paper substrates. The range of potential products can be staggering: smart labels, smart ticketing, novelty cards, smart packaging, disposable packaging, radio frequency identification tags for inventory management or food labels, disposable chemicals, biomedical sensors, single-use diagnostic devices, and even wearable sensors in healthcare. Further applications can be envisaged in security, safety, crime prevention, anti-counterfeiting, brand enhancement and merchandising, simple display, and signage sectors. The low environmental impact and cost of paper as well as its recyclability will play a big role in its commercial appeal and uptake. Paper has the potential to extend the reach of electronics into new markets that have not been considered before.